Hey, riders: Here's a quick heads up to keep you in the loop: Next Wednesday, 5/17, we'll be relocating the 27th Way & Broadway Station to the north side of Table Mesa Park N Ride! When we installed this station in 2014, funded in part by RTD, it was intended to serve regional bus routes coming to and from Denver—At the time, the B, BX, and BMX routes. When RTD discontinued the B routes and introduced the Flatiron Flyer, those buses no longer stopped at 27th Way & Broadway. As a result, use of this station dropped dramatically, and it has become one of the least-used stations in the system, seeing only a handful of trips per day. We're relocating the station to Table Mesa Park N Ride so that it can resume its original function serving regional bus routes. While we understand that this may inconvenience the handful of riders who have continued to use the 27th Way & Broadway station, we're confident that the station will do much more to ease commuting stresses in its new location. First, we're lowering the cost of trips! After 4/1, the first half hour of every trip will drop from $3 to $2--that's lower than the cost of a bus trip. In accordance with our other passes, fees for trips over 30 minutes will remain at $3 per half hour. Second, in conjunction with the launch of our app, we'll stop issuing new and replacement membership cards for the Casual Cruiser pass. Eliminating the cost of mailing membership cards is what will allow us to charge a lower rate for trips on this pass. But if you're a current Casual Cruiser pass holder, don't worry: Your current membership card will still allow you to check out bikes as long as you have it, and you can also check out bikes using the app, your credit card, or text message. Finally, we'll be changing this pass's billing schedule. Currently, Casual Cruiser trips are billed in a single sum on the first of every month. After 4/1, new Casual Cruisers will be billed for trips on a 7-day cycle. This change will make it easier for riders to upgrade to a different pass type should they so choose. Casual Cruisers registered before 4/1 will remain on a monthly billing cycle until the end of their current pass period. 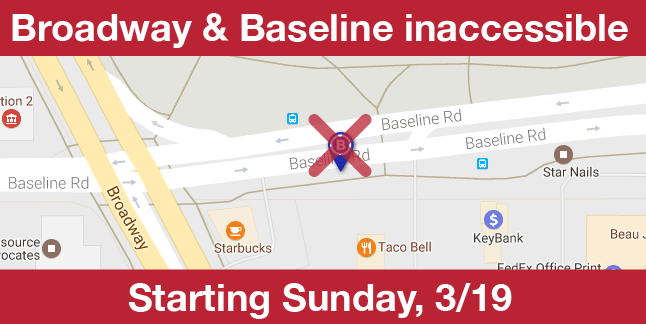 Hey riders—Just a quick heads-up that starting Sunday, March 19th, the Broadway & Baseline station will be made temporarily unavailable to allow the City of Boulder to complete the next phase of construction on the Baseline underpass. During this period, the station will be inaccessible to pedestrians. The timeline we've received from the city indicates that the station will be affected for approximately three weeks. As you may recall, this station was initially relocated further west to accommodate the first phase of construction, though unfortunately, additional relocations during this next phase of construction have proven to be logistically impossible. During this period of construction, we will be removing the station from our digital maps. Broadway & Baseline will re-open as soon as we receive clearance from the city. Apologies for any inconvenience in the interim. Note: this is a different app from the B-cycle Now app that most of you are using. While it remains a great tool for visualizing bike availability, B-cycle Now will not allow mobile bike checkout. You can download it now for iOS or Android. Mobile checkout won't work without GPS! For complete information on all the new features of the BCycle app, click here. Enter that code at the station and choose your bike! Like always, you can still check out bikes using your B-card and the credit card you have on file with your membership. Just a quick heads-up: this coming Tuesday, 2/28, our stations will experience rolling service disruptions between 9:00 AM and 5:00 PM as we update our station software. This software update will allow us to implement some brand-new features for riders, and we're excited to share those features with you shortly. You can expect 2-3 stations to be disconnected at a time, for periods of approximately 15 minutes each. 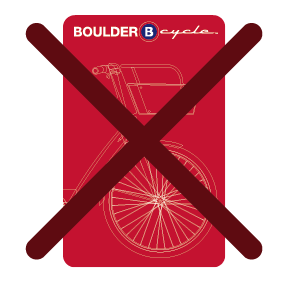 As always, keep an eye on the B-cycle Now App or our website for live station availability information.